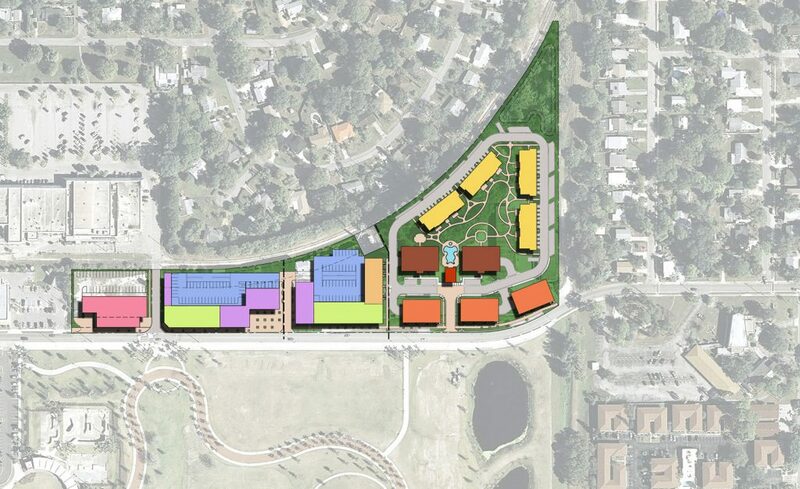 10-acre mixed use development located across Sarasota’s signature 29-acre Payne Park. The project includes 238 residential units, 100-key hotel, 55,000 sq. ft. of office and 25,000 sq. ft. of retail and restaurants. The residential units are proposed in an assortment of building products featuring garden apartments, mid-rise and wrap-around buildings. Master planning through Site Plan approval including planting, hardscape and lighting design. Master planning included building footprints, product mix and conceptual hotel design to maximize project entitlements. A public plaza, enclosed with retail and overlooking the park, anchors the mixed-use portion of the project. Phase I is composed of 110 residential units in 3, 4 and 5-story buildings arranged around a Village Green with a clubhouse and associated amenities.